between Santa Barbara and Goleta, California (often called “Noleta”). Just follow Turnpike Rd towards the mountains. It dead-ends at the park. Keep bearing right until you can drive no further and you’re there! 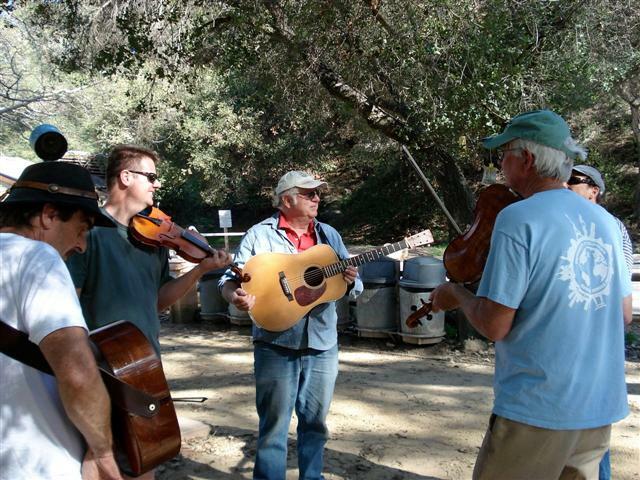 My friend Alan Aleksander hosts the thing these days – it tends to be bluegrass-oriented, but I’d sure like to see some old time musicians show up – there’s plenty of room for several jam groups, or even better – a trade off of songs and tunes. Time: noon to whenever. Made it to the jam for a couple of hours. It was great fun – helped out a lot by the beautiful day. There was running water in the creek, and the afternoon was warm enough to get the frogs up out of the mud to add their vocals to what was going down. For a while, we had three groups all going at once – I much prefer this style of jam to the one large group concept.